To-do list? A-Z tabs? Calendar? No. None of those. The most important part of my planner is the notes page. Yes, you read that right – the notes page. I’ve been using Franklin Covey’s two pages per day for 20 years and the Notes page has been and will continue to be the most important part of my planner. The notes page is important because that’s where all the good stuff is. In the future, no one is going to care about what was on my to-do list or what appointments I had that day. But the information on the notes page is interesting. It’s important. It’s valuable. It’s a record of my life and my family’s lives. When I need to write something down, I never have to think about where to write it. I grab my planner and start writing on the notes page. When I need to retrieve information, I don’t have to wonder where it is. I know it will be on one of my notes pages. Of course, the key to retrieving information from the notes pages is the monthly index. 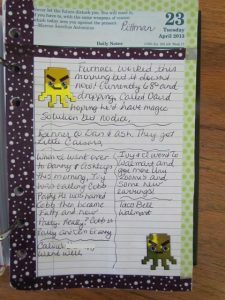 And now, here are a few samples of some of my notes pages. 1. Information. When anyone tells me anything, I write it down on the notes page. For example, yesterday I went to Public Storage to rent a storage unit (we’re moving in with family until we find a house) and I pulled out my planner and wrote down the important information – like unit number and password. Yes, they gave me paperwork with all that information, but in the chaos of moving, I might accidentally misplace it and then I won’t know which unit or how to get in. But I promise you I won’t misplace my planner. 2. Lists. My daughter was coming over one day and I had several things I wanted to ask her about. I made a list on the Notes page, and when she got here, I made sure I asked her everything I had written down. I always think I’ll remember but I don’t. 3. I use it as a journal. I used to record funny things the kids said and did. Now I use it to record funny things the grandkids say and do. I love looking back and reading about their antics. 4. I track ongoing issues. 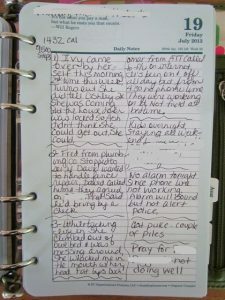 I’m currently dealing with some pretty major peri-menopause symptoms and I record on the Notes page what’s going on. 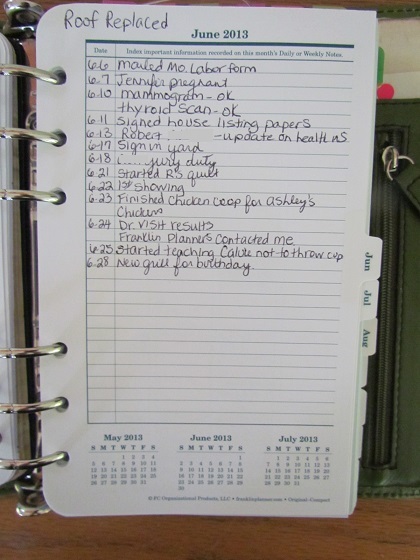 It helps me see patterns and provides information for doctor appointments. 5. I record questions I want to ask at future doctor appointments. If I have a doctor’s appointment scheduled for the next month, as I think of things I want to ask or talk about, I turn to the appropriate page and write my notes on the page. 6. When I sign up for a new on-line account, I record the user id and password on the notes page. Then I put that same information in the A-Z tabs. 8. I record things that happen. For example, about a month ago a plumbing company was working on the road near our house. The dump truck’s brakes failed and the truck, pulling a trailer carrying a backhoe, rolled down the hill. One of the employees jumped in the truck and got it stopped but not before the trailer clipped the edge of the road and turned over. The still running backhoe landed on our split rail fence. Yes – this kind of stuff happens to us on a regular basis. Anyway, I wrote details about what happened as well as took pictures. And in case you’re wondering, the company paid for the fence. My son and I were having a discussion about my memory recently. I told him that I had a great memory. He said, “You don’t have a great memory. You just have a great system.” Wow. He was right. 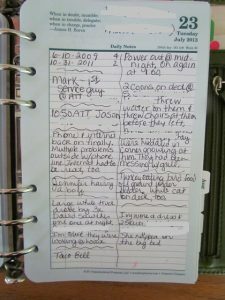 I have a great system and it helps me remember the details of my life. And the most important part of my system is the notes page. It’s the glue that holds it all together. 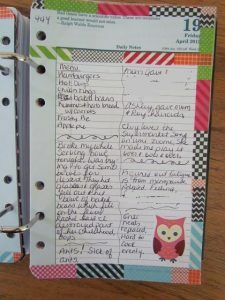 Do you have a notes page? 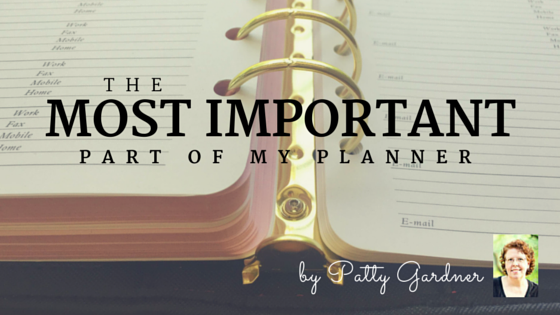 Do you have a place in your planner where you write everything? How easy is it for you to retrieve information?